The event featured performances from Tom Fletcher and Russell Watson. The Torch of rememberance was carried on by a flight lieutenant. This was Followed by A reading by 97 year old bomber command veteran Colin Bell of Michael Morpurgo. The Chelsea Pensioners attended. There was A recording from World War I captain Mabely Esler of the Royal medical corps. The Band of the Royal Marines played,”Vindictive”. Sheridan Smith then sang “are you just Sleeping”. Extracts of Sir Wilfred Owen’s poems were read by Michael Palin and Adrian Lester. Palin also read “Epitaphs of the war” by Rudyard Kipling. Bryn Terfyl then sang Roses in Piccadilly and Nina Wadia gave a poignant reading. Sheku Kennah Mason also performed Hallelujah on cello while Photographs of many who died during World War I were shown by their relatives. Sir Tom Jones then performed Precious Lord. There was a performance of Sir Edward Elgar’s Jerusalem and TheKingdom Choir performed the Lord’s Prayer. The service chaplains Peter John Baptiste, Monsignor Andrew McFadden and Reverend Nia Williams then All gave readings. Right Reverend James Newcome also gave a reading and Sir Bryn Trfyl sang Amazing Grace. Personnel from the army, navy and Royal Air Force were represented by 110 members of The Royal Navy led by leutenant commander Michael bray, the Royal Navel Nursing Service , the Royal marines, Royal navy reserves, The Royall marine reserves. Cold stream guards, Royal regiment of fusiliers, the gurkhas, queen Alexandra Royal nursing corps, the Royal Yeomanry, maritime logistics corps, Royal Airforce, the Queen’s colour squadron, the Royal. airforce nursing service, Royal auxillery Air force, University Air Squadren, the Merchant Navy. There were also representatives of various members of the Commonwealth and more than 80 affiliated organisations. Plus members of civillian services includong the Royal British Legion, St Johns Ambulance and Royal Voluntary Service. The festival, included the traditional two-minute silence as poppy petals fall from the roof of the Royal Albert Hall, each representing a life lost in war. The event, which had an audience of veterans and their families, served as a moving tribute to the country’s fallen. A bugler then sounded The Last Post before a piper from The Royal Dragoon Guards played a traditional lament. They were joined by coalition representatives from the USA, Denmark, Estonia and Bosnia as well as senior officers from the Afghan National Security Forces. There was a rousing performance of I Vow to thee My Country, followed by the National Anthem before Garrison Sergeant Andrew Stokes brought procedings to a close. English author Neil Gaiman was born 10 November 1960 in Portsmouth. After living for a period in the nearby town of Portchester, Hampshire, where Neil was born in 1960, the Gaimans moved in 1965 to the West Sussex town of East Grinstead, where his parents studied Dianetics at the town’s Scientology centre; one of Gaiman’s sisters works for the Church of Scientology in Los Angeles. Gaiman was able to read at the age of four. For his seventh birthday, Gaiman received C. S. Lewis’s The Chronicles of Narnia series and by the time he was about ten years old, he read his way through the works of Dennis Wheatley, such as The Ka of Gifford Hillary and The Haunting of Toby Jugg. Another novel that made a particular impression on him was J. R. R. Tolkien’s The Lord of the Rings which also inspired his desire to become an author. Narnia also introduced him to literary awards, specifically the 1956 Carnegie Medal won by the concluding volume. Lewis Carroll’s Alice’s Adventures in Wonderland was another childhood favourite, and He also enjoyed reading Batman comics as a child. Gaiman was educated at several Church of England schools, including Fonthill School in East Grinstead, Ardingly College (1970–74), and Whitgift School in Croydon (1974–77). His father’s position as a public relations official of the Church of Scientology was the cause of the seven-year-old Gaiman being blocked from entering a boys’ school, forcing him to remain at the school that he had previously been attending. He lived in East Grinstead from 1965 to 1980 and again from 1984 to 1987. He met his first wife, Mary McGrath, while she was studying Scientology and living in a house in East Grinstead that was owned by his father. The couple were married in 1985 after having their first child, Michael. As a child and a teenager, Gaiman read the works of C. S. Lewis, J. R. R. Tolkien, Lewis Carroll, Mary Shelley, Rudyard Kipling, Edgar Allan Poe, Alan Moore, Steve Ditko, Will Eisner, Ursula K. Le Guin, Harlan Ellison, Lord Dunsany and G. K. Chesterton. He was also inspired by Roger Zelazny, Michael Moorcock, Samuel R. Delany, Angela Carter, and R.A. Lafferty Whom he contacted When he was 19–20 years old, asking for advice on becoming an author along with a Lafferty pastiche he had written. The writer sent Gaiman an encouraging and informative letter back, along with literary advice. During the 1980s, Gaiman worked as a journalist, conducting interviews and writing book reviews, as a means to learn about the world and to make connections that he hoped would later assist him in getting published. He wrote and reviewed extensively for the British Fantasy Society. His first professional short story publication was “Featherquest”, a fantasy story, in Imagine Magazine in May 1984. When waiting for a train at London’s Victoria Station in 1984, Gaiman noticed a copy of Swamp Thing written by Alan Moore, and carefully read it. Moore’s fresh and vigorous approach to comics inspired Gaiman and he began visiting London’s Forbidden Planet to buy comics. In 1984, he wrote his first book, a biography of the band Duran Duran, as well as Ghastly Beyond Belief, a book of quotations, with Kim Newman. he was also offered a job by Penthouse but refused. He also wrote interviews and articles for many British magazines, including Knave using pseudonyms, including Gerry Musgrave and Richard Grey. Gaiman ended his journalism career in 1987 andIn the late 1980s, he wrote Don’t Panic: The Official Hitchhiker’s Guide to the Galaxy Companion in what he calls a “classic English humour” style. In 1987 Gaiman started writing comic-books, for comic-book writer Alan Moore picking up Miracleman after Moore finished his run on the series. Gaiman and artist Mark Buckingham collaborated on several issues of the series before its publisher, Eclipse Comics, collapsed, leaving the series unfinished. His first published comic strips were four short Future Shocks for 2000 AD in 1986–87. He wrote three graphic novels with his favourite collaborator and long-time friend Dave McKean: Violent Cases, Signal to Noise, and The Tragical Comedy or Comical Tragedy of Mr. Punch. Impressed with his work, DC Comics hired him in February 1987, and he wrote the limited series Black Orchid. Karen Berger, head of DC Comics’s Vertigo, then read Black Orchid and offered Gaiman a job: to re-write The Sandman. This tells the tale of the ageless, anthropomorphic personification of Dream that is known by many names, including Morpheus and is a mixture of fantasy, horror, and ironic humour. In the eighth issue of The Sandman, Gaiman and artist Mike Dringenberg introduced Death, the older sister of Dream, who would become as popular as the series’ title character and In 1993 DC launched Vertigo with The limited series Death: The High Cost of Living. The 75 issues of the regular series, along with an illustrated prose text and a special containing seven short stories, have been collected into 12 volumes that remain in print, 14 if the Death: The High Cost of Living and Death: The Time of Your Life spin-offs are included. Artists include Sam Kieth, Mike Dringenberg, Jill Thompson, Shawn McManus, Marc Hempel and Michael Zulli, lettering by Todd Klein, colours by Daniel Vozzo, and covers by Dave McKean. The series became one of DC’s top selling titles, eclipsing even Batman and Superman. Gaiman and Jamie Delano were due to become co-writers of the Swamp Thing series following Rick Veitch. However An editorial decision by DC to censor Veitch’s final storyline caused both Gaiman and Delano to withdraw. Gaiman then produced two stories for DC’s Secret Origins series in 1989. A Poison Ivy and a Riddler. A Riddler was originally written for Action Comics Weekly but was shelved due to editorial concerns however it was finally published in 2000 as Green Lantern/Superman: Legend of the Green Flame. In 1990, Gaiman wrote The Books of Magic, a four-part mini-series that provided a tour of the mythological and magical parts of the DC Universe through a frame story about an English teenager who discovers that he is destined to be the world’s greatest wizard. The miniseries was popular, and sired an ongoing series written by John Ney Rieber. Sadly Gaiman’s adaptation of Sweeney Todd, illustrated by Michael Zulli for Stephen R. Bissette’s publication Taboo, was discontinued. In the mid-1990s, he also created a number of new characters and a setting that was to be featured in a title published by Tekno Comix. The concepts were then altered and split between the titles: Lady Justice, Mr. Hero the Newmatic Man, and Teknophage, Gaiman then wrote a semi-autobiographical story about a boy’s fascination with Michael Moorcock’s anti-hero Elric of Melniboné for Ed Kramer’s anthology Tales of the White Wolf. Neil Gaiman also collaborated with Terry Pratchett on his first comic novel Good Omens which was published in 1990. The 1996 novelisation of Gaiman’s teleplay for the BBC mini-series Neverwhere was his first solo novel. The novel was released in tandem with the television series though it presents some notable differences from the television series. Gaiman has since revised the novel twice, the first time for an American audience unfamiliar with the London Underground, the second time because he felt unsatisfied with the original. In 1999, Gaiman published his fantasy novel Stardust, which was highly influenced by Victorian fairytales and culture and has been released as a standard novel and in an illustrated graphic novel. 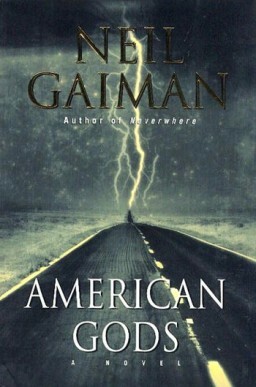 Gaiman’s next novel American Gods was published in 2001 and has become one of Gaiman’s best-selling and multi-award-winning novels. Gaiman’s characters from American Gods also Crop up in a short story set in Scotland, which applies the same concepts developed in American Gods to the story of Beowulf. Gaiman’s next novel Anansi Boys was published in 2005 and deals with Anansi (‘Mr. Nancy’), tracing the relationship of his two sons, one semi-divine and the other an unassuming Englishman, as they explore their common heritage. In 2008, Gaiman published The Graveyard Book which follows the adventures of a boy named Bod after his family is murdered and he is left to be brought up by a graveyard. It is heavily influenced by Rudyard Kipling’s The Jungle Book. In 2013 Gaiman published The Ocean at the End of the Lane which follows an unnamed man who returns to his hometown for a funeral and remembers events that began forty years earlier and was voted Book of the Year in the British National Book Awards. In 2017 Neil Gaiman published the novel Norse Mythology. Gaiman has also written prolifically for television. In 1996 wrote BBC dark fantasy television series Neverwhere and cowrote the screenplay for the movie MirrorMask with his old friend Dave McKean for McKean to direct. In addition, he wrote the localised English language script to the anime movie Princess Mononoke, based on a translation of the Japanese script. He alsomcowrote the script for Robert Zemeckis’s Beowulf with Roger Avary, And has expressed interest in collaborating on a film adaptation of the Epic of Gilgamesh. Neil Gaiman was featured in the History Channel documentary Comic Book Superheroes Unmasked. He also wrote the script for the Babylon 5 episode “Day of the Dead. Gaiman’s novel Stardust has also been made into a film starring Charlie Cox, Robert De Niro, Michelle Pfeiffer, Claire Danes, and directed by Matthew Vaughn. A stop motion version of Coraline was released in 2009, with Henry Selick directing and featuring the voices of Dakota Fanning and Teri Hatcher. Gaiman’s 2009 Newbery Medal winning book The Graveyard Book will also be made into a movie, directed by Ron Howard. In 2011 Gaiman wrote an episode of Doctor Who, called The Doctor’s Wife Featuring Matt Smith and Alex Kingston which won the 2012 Hugo Award for Best Dramatic Presentation (Short Form). Gaiman also appeared as himself on The Simpsons episode “The Book Job” broadcast on 20 November 2011. In 2013 Gaiman wrote another episode of Doctor Who titled “Nightmare in Silver”. A six-part radio play of Neverwhere was broadcast in March 2013, adapted by Dirk Maggs for BBC Radio 4 and Radio 4 Extra. Featured stars include James McAvoy as Richard, Natalie Dormer, Benedict Cumberbatch, Christopher Lee, Bernard Cribbens and Johnny Vegas. Neil Gaiman’s novel American Gods has also been adapted for television. In 2014, Gaiman and Terry Pratchett joined forces with BBC Radio 4 to make the first ever dramatisation of their co-penned novel Good Omens, which was broadcast in December in five half-hour episodes and culminated in an hour-long final apocalyptic showdown and there is also a forthcoming television adaptation of Good Omens starring David Tennant and Michael Sheen. Throughout his prolific career Neil Gaiman has won numerous awards, including the Hugo, Nebula, and Bram Stoker awards, as well as the Newbery and Carnegie medals. He is the first author to win both the Newbery and the Carnegie medals for the same work, The Graveyard Book (2008). In 2013, The Ocean at the End of the Lane was voted Book of the Year in the British National Book Awards. Accounting can be divided into several fields including financial accounting, management accounting, external auditing, tax accounting and cost accounting. Accounting information systems are designed to support accounting functions and related activities. Financial accounting focuses on the reporting of an organization’s financial information, including the preparation of financial statements, to the external users of the information, such as investors, regulators and suppliers; and management accounting focuses on the measurement, analysis and reporting of information for internal use by management. The recording of financial transactions, so that summaries of the financials may be presented in financial reports, is known as bookkeeping, of which double-entry bookkeeping is the most common system. Accounting is facilitated by accounting organizations such as standard-setters, accounting firms and professional bodies. Financial statements are usually audited by accounting firms, and are prepared in accordance with generally accepted accounting principles (GAAP) GAAP is set by various standard-setting organizations such as the Financial Accounting Standards Board (FASB) in the United States and the Financial Reporting Council in the United Kingdom. As of 2012, “all major economies” have plans to converge towards or adopt the International Financial Reporting Standards (IFRS). National Sesame Street Day takes place on November 10 to commemorate the anniversary of the first broadcast of Sesame Street on November 10, 1969. It was founded in New York City, by a Mayoral Proclamation from Michael Bloomberg, who established November 10, 2009 as “Sesame Street Day,” a day to mark the show’s 40th Anniversary. To celebrate, the corner of 64th Street and Broadway in Lincoln Square was temporarily renamed 123 Sesame Street with a dedication ceremony on November 9, 2009. The format of Sesame Street consists of a combination of commercial television production elements and techniques which have evolved to reflect the changes in American culture and the audience’s viewing habits. With the creation of Sesame Street, producers and writers of a children’s television show used, for the first time, educational goals and a curriculum to shape its content. It was also the first time a show’s educational effects were formally studied. The show, therefore, has undergone significant changes in its history as adjustments to the format and content have been made to reflect change sources to the curriculum. Sesame Street Became the fifteenth-highest-rated children’s television show in the United States. A 1996 survey found that 95% of all American preschoolers had watched the show by the time they were three years old. By the end of the 1990s, Sesame Street faced societal and economic challenges, including changes in viewing habits of young children, competition from other shows, the development of cable television, and a drop in ratings.After the turn of the 21st century, Sesame Street made major structural changes and from 2002, its format became more narrative and included ongoing storylines. After its thirtieth anniversary in 1999 and due to the popularity of the Muppet Elmo, the show also incorporated a popular segment known as “Elmo’s World”. By 2006, there were independently produced versions, or “co-productions”, of Sesame Street broadcast in twenty countries. In 2001, there were over 120 million viewers of various international versions of Sesame Street, and by the show’s 40th anniversary in 2009, it was broadcast in more than 140 countries. In 2008, it was estimated that 77 million Americans had watched the series as children and Upon its fortieth anniversary in 2009, the show received a Lifetime Achievement Emmy at the 36th Daytime Emmy Awards and it was estimated that 77 million Americans had watched the series as children and Sesame Street had been broadcast in over 120 countries, and 20 international versions had been produced. In 2015, as part of a five-year programming and development deal, Sesame Workshop announced that first-run episodes of Sesame Street would move to premium television service HBO beginning with season 46, which premiered In 2016. HBO will hold first-run rights to all newer episodes of the series, after which they will air on PBS member stations following a nine-month exclusivity window, with no charge to the stations for airing the content. The agreement also gives HBO exclusive rights to stream past and future Sesame Street episodes on HBO Go and HBO Now – assuming those rights from Amazon Video and Netflix. Sesame Workshop also announced that it would phase out its in-house subscription streaming service, Sesame Go, as a standalone service; the service will remain in operation, likely with its offerings reduced to a slate content available for free or serving as a portal for Sesame Street’s website. As of 2014, Sesame Street has won 167 Emmy Awards and 8 Grammy Awards—more than any other children’s show. In April 2017, Sesame Street introduced Julia, a new Muppet who has autism, performed by Stacey Gordon, who has a son on the autism spectrum. English painter, printmaker, pictorial satirist, social critic, and editorial cartoonist William Hogarth was born 10 November 1697. He has been credited with pioneering western sequential art. His work ranged from realistic portraiture to comic strip-like series of pictures called “modern moral subjects”. Knowledge of his work is so pervasive that satirical political illustrations in this style are often referred to as “Hogarthian” He first worked as an engraver in 1720, engraving coats of arms, shop bills, and designing plates for booksellers. Then in 1727, he was hired by Joshua Morris, a tapestry worker, to prepare a design for the Element of Earth. In 1757 he was appointed Serjeant Painter to the King. Early satirical works included an Emblematical Print on the South Sea Scheme, about the disastrous stock market crash known as the South Sea Bubble, in which many English people lost a great deal of money. This features Protestant, Catholic, and Jewish figures gambling, while in the middle there is a huge machine, like a merry-go-round, which people are boarding. At the top is a goat, written below which is “Who’l Ride”. Other early works include The Lottery ; The Mystery of Masonry brought to Light by the Gormogons ; A Just View of the British Stage ; some book illustrations; and the small print, Masquerades and Operas. He continued this theme in 1727, with the Large Masquerade Ticket. In 1726 Hogarth prepared twelve large engravings for Samuel Butler’s Hudibras including The Assembly at Wanstead House. he then turned his attention to the production of small “conversation pieces” . Among his paintings were The Fountaine Family (c.1730), The Assembly at Wanstead House, The House of Commons examining Bambridge, and several pictures of The Beggar’s Opera. Hogarth’s depiction of John Dryden’s The Indian Emperor, or The Conquest of Mexico at the home of John Conduitt, master of the mint, in St George’s Street, Hanover Square, A Midnight Modern Conversation, Southwark Fair , The Sleeping Congregation Before andAfter, Scholars at a Lecture’ The Company of Undertakers (Consultation of Quacks), The Distrest Poet (1, The Four Times of the Day, and Strolling Actresses Dressing in a Barn are also Masterpeices. In 1731, Hogarth completed the earliest of the series of moral works A Harlot’s Progress. This features six scenes, concerning the miserable downfall of a country girl who who starts off happy and healthy in the Countryside then moves to town where she is forced Into a career as a prostitute to make money and her life gradually goes downhill and gets more shameful and degrading until eventually she dies of venereal disease and has a merciless funeral ceremony. This was followed in 1735 by the sequel A Rake’s Progress which portrays the reckless life of Tom Rakewell, the son of a rich merchant, who starts off promisingly, but wastes all his money on luxurious living, whoring, and gambling, until he ultimately finishes his life in locked up in Bedlam. In 1743–1745, Hogarth painted the six pictures of Marriage à-la-mode, a moralistic satire of upper-class 18th-century society which shows the miserable tragedy of an ill-considered marriage for money rather than love. They are set in a Classical interior, and show the story of the fashionable marriage of the son of bankrupt Earl Squanderfield to the daughter of a wealthy but miserly city merchant, starting with the signing of a marriage contract at the Earl’s mansion and ending with the murder of the son by his wife’s lover and the suicide of the daughter after her lover is hanged at Tyburn for murdering her husband. In the twelve prints of Industry and Idleness (1747) Hogarth shows the progression in the lives of two apprentices, one of whom is dedicated and hard working, the other idle. This shows that those who work hard such as the industrious apprentice get rewarded, and he becomes Sheriff, Alderman, and finally the Lord Mayor of London. Whilst idle apprentice, begins with being “at play in the churchyard”, holes up “in a Garrett with a Common Prostitute” after turning highwayman) and is eventually “executed at Tyburn” after being sent to the gallows by the industrious apprentice himself. Later important prints include his pictorial warning of the unpleasant consequences of alcoholism in Beer Street and Gin Lane, which shows a happy city drinking the ‘good’ beverage of English beer, versus Gin Lane which showed the effects of drinking gin which, as a harder liquor, caused more problems for society. People are shown as healthy, happy and prosperous in Beer Street, while in Gin Lane they are scrawny, lazy and careless. The prints were published in support of what would become theGin Act 1751. Another print The Four Stages of Cruelty, is a cautionary print in which Hogarth depicts what happens to people who are cruel to animals and people. It features the downfall of Tom Nero, a coach driver whose cruelty to his horse causes it to break its leg. Tom is then depicted murdering a woman, until in the last print titled Reward of Cruelty, Tom gets his comeuppance and is executed for his crimes and is shown being dissected by scientists after his execution. The method of execution, and the dissection, reflect the 1752 Act of Parliament. Other notable prints include The Pool of Bethesda and The Good Samaritan, Moses brought before Pharaoh’s Daughter, Paul before Felix, his altarpiece for St. Mary Redcliffe, Bristol and The Gate of Calais. Hogarth sadly died in London on 26 October 1764 and was buried at St. Nicholas’s Churchyard, Chiswick Mall, Chiswick, London.